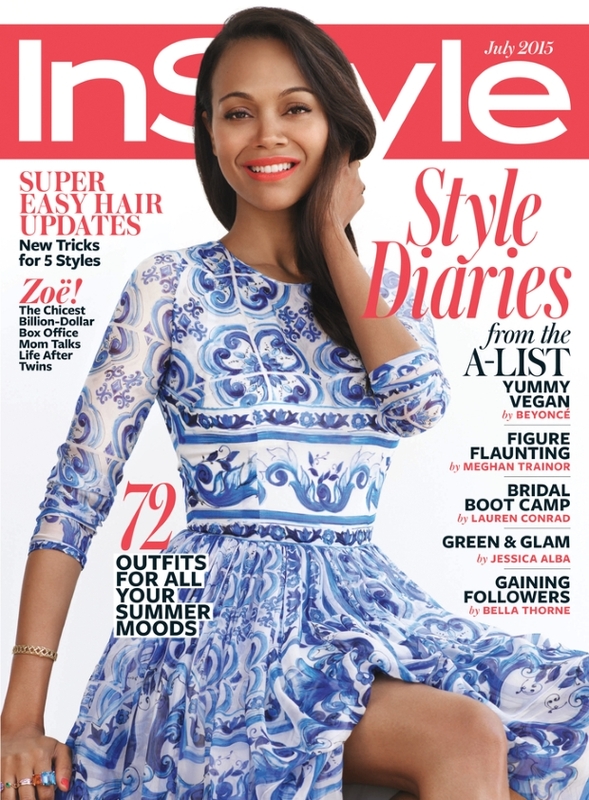 InStyle failed to impress with its Mindy Kailing cover and now tries to win us over with the July 2015 issue. Zoe Saldana graces the cover of the magazine’s newest offering, wearing a dress by Dolce & Gabbana as she flashes an energetic smile and plays with her hair for photographer Paul Maffi. But forum members slammed the image for its lackluster styling, hair and makeup. MON was the first forum member to get the discussion started. “Something is awfully wrong about that cover. Not to be mean but she looks tired like she’s saying ‘I haven’t had enough sleep but I have to smile for this magazine.’ Also, that lipstick looks fake! Photoshop some more!” he complained. “I could not write it better,” laughed GlamorousBoy in agreement. “What bothers me most is the lack of production values. It really looks like they dropped by her place and shot this in a rush. The dress is unremarkable, hair is too simple for a cover. This wouldn’t look out of place on Easy Living. She just doesn’t look polished enough for my liking,” added an underwhelmed Benn98. “Zoe’s ed is actually pretty good. Nothing outstanding but it’s cozy, she’s lovely and I really like the softness these pics convey,” admired Aby, the moment Saldana’s cover story surfaced. But Benn98 wasn’t having any of it and returned to the thread, voicing, “Cannot bear to look at Zoe Saldana’s edit. She’s not the most captivating subject. There’s literally no styling and the photography is just lazy and contrived. I hope this won’t be the new direction for future editorials. Bring [Giampaolo] Sgura back! !” he cried. Check it out for yourself and join the discussion here.